Livre du Jour: Barnes & Noble announces the new Nook! Today Barnes & Noble announced the new Nook, the "Simple Touch Reader". As the trademarked name indicates, this new eInk device is a touchscreen, which eliminates the navigation touchscreen on the original Nook, and the clumsy buttons on the Kindle. The new Nook replaced the original Nook, and will sell side-by-side with the Nook Color, since they are really targeting two very different groups of people — those who just want to read books, and those who want a tablet that also happens to be an ebook reader. 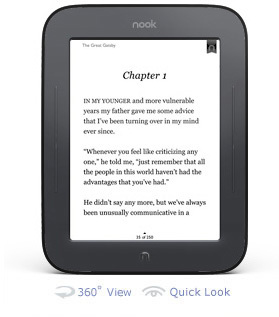 Since the Nook Touch is targeting people who just want to read, they've eliminated many of the extra features from the original, which most of us dedicated readers don't use anyway: no games, web browser, or MP3 player. The new Nook also doesn't have a 3G option — it's wifi only, which means you need to have access to a wifi network in order to shop and download books. I think there are a few reasons for this. First of all, you don't need the Internet just to read, and I think B&N assumed that the 3G feature really wasn't needed after all. And of course, I suspect they wanted to reduce the new Nook to the bare bones as much as possible, so that they could keep the price low. Their 3G contract with AT&T cost them money, since unlike the iPad, your 3G connectivity on the Nook is free to you. I think they are planning to end that contract, though, since they are now selling the 3G models on eBay as wifi only. If you preorder the new Nook now, it'll ship on June 10th. I plan to be in the store that day so that I can see the new Nook in person. I have a few concerns, such as whether the touchscreen is shiny (I think reading on a shiny eInk screen would be awkward), how you get to sideloaded ebooks, and whether the new Nook preserves the shelves feature for organizing your ebooks. I still love my original Nook, so I probably won't be rushing out to buy this one, but I'd still like to have my questions answered so that I know what I'm in for when it comes time for an upgrade.